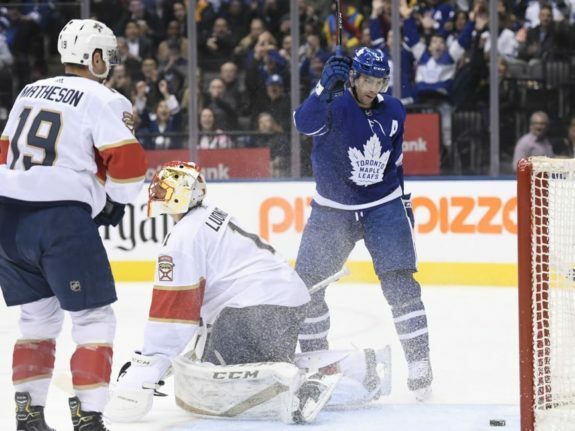 TORONTO — John Tavares recorded the first four-goal game of his career as the Toronto Maple Leafs downed the Florida Panthers 7-5 on Monday night. The star centre, who signed a seven-year, US$77-million contract with the Leafs in free agency on July 1, now has 45 goals on the season — the most ever by a player in his first season with the franchise. Tavares, who also has nine three-goal games since being drafted first overall by the New York Islanders in 2009, jumped into second in the NHL in goals in 2018-19, three back of Washington Capitals sniper Alex Ovechkin. Zach Hyman, with a goal and two assists, Patrick Marleau and Jake Muzzin provided the rest of the offence for Toronto (45-25-6). Mitch Marner had three assists, while Morgan Rielly and William Nylander added two each in front of a crowd of 19,125 at Scotiabank Arena. Frederik Andersen made 31 saves for the Leafs, who started the night seven points back of the Boston Bruins for second in the Atlantic Division and are almost assured of meeting their rivals for a second straight spring in the first round of the playoffs. Jayce Hawryluk scored twice and added an assist for Florida (33-31-12), while Jonathan Huberdeau, with two, and Mike Matheson also scored. Evgenii Dadanov and Mike Hoffman each had two assists. Rookie netminder Sam Montembeault allowed two goals on four shots before getting the hook just over four minutes into game. Roberto Luongo, who was scheduled to get the night off with the Panthers set to visit the 39-year-old’s hometown Montreal Canadiens on Tuesday, made 28 saves in relief. Toronto entered play 2-4-1 over its last seven games, including Saturday’s 2-1 overtime loss at home to the New York Rangers, but had played better during a recent 1-1-1 stretch after surrendering 23 goals in four prior outings over a six-day span from March 11 to 16. The Leafs got on the board early against Florida when Marleau — who suited up for the 1,651st regular-season game of his career to tie Chris Chelios for sixth all-time in the NHL — took a nice one-touch feed from Nazem Kadri and beat Montembeault on the shortside for his 16th goal of the season, and second in his last 13 outings. Muzzin then made it 2-0 with his ninth at 4:21 when he blasted a shot past Montembeault, who was promptly replaced by Luongo. Tavares scored his first of the evening on the power play 11:05 when he snuck a between-the-legs backhand through Luongo’s five-hole from the lip of the crease. Kasperi Kapanen nearly made it 4-0 moments later, but Luongo was there to rob the Toronto winger, who now has just one goal in his last 16 games, with a great glove save on a breakaway. Hawryluk got Florida on the board at 13:23 when he tipped his sixth past Andersen off the rush to make it 3-1, but Tavares added his second just 1:19 later when he lost his check in front and tapped Hyman’s pass beyond a helpless Luongo. Matheson blasted his eighth through a screen on Andersen at 16:25 to give the Panthers, who came in with a minuscule hope of making the playoffs, a bit of life heading to the locker rooms. But Tavares made it 5-2 on a rebound off the rush at 5:51 of the second to complete his hat trick after Rielly took the initial shot as hats rained down to salute the 28-year-old’s second three-goal game of the season. Tavares scored his fourth of the game to make it 6-2 on another tap-in at 3:57 of the third. Huberdeau got his 24th at 5:34, but Hyman was left all alone in front to make it 7-3 with his 20th at 6:51. Then with the Leafs shorthanded, Huberdeau ripped his second of the night with 6:24 remaining on the clock. Hawryluk scored his second of the night with 2:24 remaining to make it 7-5. “The challenge for us is playing the best we can and feeling good about ourselves,” Leafs head coach Mike Babcock said before the game of his team’s preparations before the playoffs. “We’ve talked lots about what we’ve been through. We’ve liked our game in the last three games. NOTES: Tavares is the fourth member of the Leafs in the last 20 years to record a four-goal game, and the first since Auston Matthews made his debut in October 2016. … Eddie Olczyk held the previous record for goals in an inaugural season with Toronto when he scored 42 in 1987-88. … Tavares also recorded a hat trick on Oct. 7 against the Chicago Blackhawks. … Toronto defenceman Travis Dermott (shoulder) took part in the morning skate minus a non-contact jersey for the first time since getting Feb. 27. Fellow blue-liner Jake Gardiner (back) also skated before the main session. … The Leafs visit the Philadelphia Flyers on Wednesday before taking on the Ottawa Senators in the nation’s capital on Saturday. … Florida is at Montreal on Tuesday and Ottawa on Thursday.